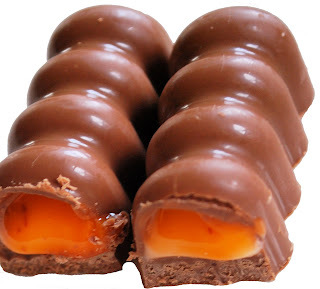 These new Cadbury Creme Egg Twisted candy bars are perfection. I've been waiting for these all my life and only bemoan their scarcity. I've been a big fan of Cadbury Creme Eggs for years. In fact, as a child my mom once got me across the country on a slow-moving train by promising me one Cadbury Creme Egg a day and it was worth it. I've always felt that it's awkward to eat that delicious cream filling in egg form, unnecessarily messy from the proportions of the egg. This double candy bar simply elongates the original egg, allowing you far more control in your consumption of the sticky filling. It's wonderful. This incredible find merits a special shout out of thanks to my friend Dan who has an innate gift for finding elusive limited edition candy in the unlikeliest of places. The best it to heat the bar for 5 - 6 seconds to melt the inside and let it flow into your mouth after the first bite! !